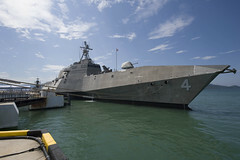 The littoral combat ship USS Coronado (LCS 4) participated in the Langkawi International Maritime and Aerospace (LIMA) Exhibition 2017, March 25-26. 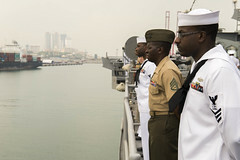 USS Comstock (LSD 45) and embarked Marines from the 11th Marine Expeditionary Unit arrived in Colombo for a military-to-military engagement, March 27. 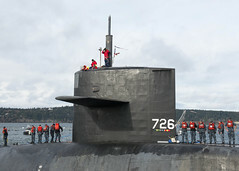 The guided-missile submarine returned to the Pacific Northwest March 23 after being deployed for 20 months in the Pacific. 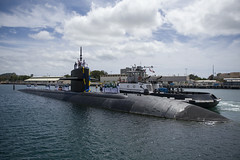 The Los Angeles-class fast-attack submarine returned home to Joint Base Pearl Harbor-Hickam, March 23, following a six-month deployment. 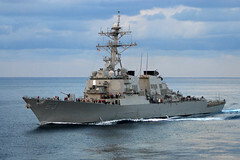 The guided-missile destroyer USS Stethem (DDG 63) is scheduled to arrive in Jeju-do, March 25 for a port visit. 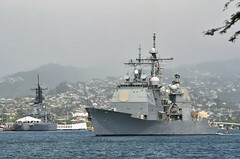 The guided-missile cruiser will return to Joint Base Pearl Harbor-Hickam, March 24, following a 212-day independent deployment to the U.S. 5th and 7th Fleet areas of operation. 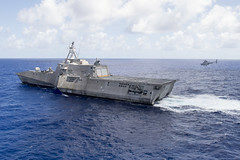 The U.S. Navy and Japan Maritime Self-Defense Force destroyers recently conducted a passing exercise in the South China Sea. Vice Adm. Joseph P. Aucoin and a variety of U.S. Navy and Air Force assets are taking part in Malaysia's Langkawi International Maritime and Aerospace (LIMA) Exhibition 2017, March 21-25. 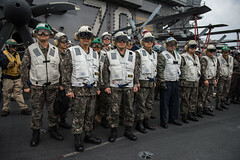 The chiefs of staff for the Republic of Korea's army and air Force and the ROK chief of naval operations visited USS Carl Vinson (CVN 70) at sea, March 20. 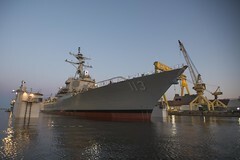 The future guided-missile destroyer will be commissioned July 15 during a ceremony at Joint Base Pearl Harbor-Hickam, Hawaii.